While ZTE has mostly focused on sales through carriers in the US, and mostly of low-to-mid range devices, one can't help but hope that its premium Nubia line of smartphones makes it stateside sooner rather than later. Making matters worse are the non-stop leaks related to the upcoming flagship update in the Nubia Z9. 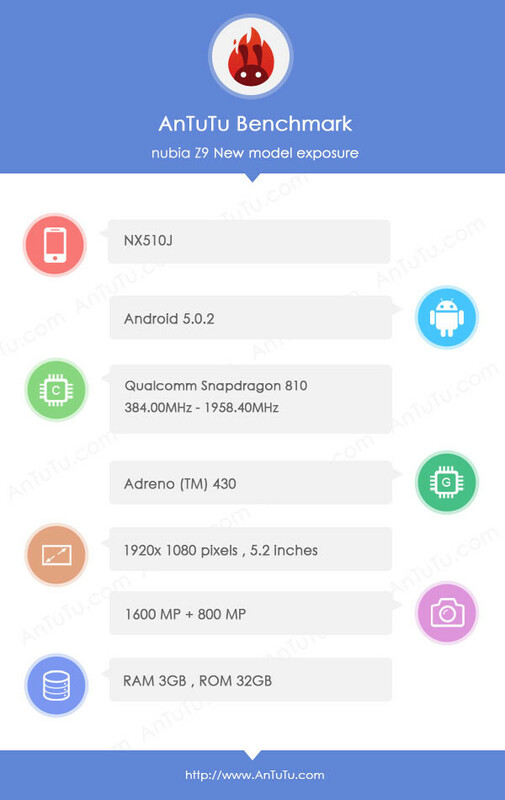 But while alleged sightings of the Z9, along with supposed specs sheets, have proved common over the last month or two, it wasn't until today that we got our hands on something a tad more believable – an AnTuTu benchmark pass of a device codenamed NX510J, believed to be no other than the Nubia Z9. According to the specs trail, the Z9 will sport a 5.2-inch display with a resolution of 1080 x 1920, for a pixel density of 424 ppi, an octa-core Qualcomm Snapdragon 810 processor, and 3GB of RAM. Furthermore, it is revealed that the device in question will tout a 16-megapixel camera at the back (optical stabilization likely), and an 8-megapixel selfie snapper at the front. The unit ran on Android 5.0.2 Lollipop. Now, we've got to point out that with specs such as these, the Nubia Z9 outlined above may very well be the Nubia Z9 mini or Z9 Max, if ZTE continues with the same strategy of releasing three flagship devices per cycle. The rationale here is simple – the previous generation Nubia Z7 had a display size of 5.5-inch, so unless the company has decided against big screens, it is possible that the 5.2-incher we're looking at actually ends up as the Z9 Mini. Furthermore, we should also point out that the Nubia Z7 was, confusingly, more impressive than the Z7 Max (1080p), owing to its 1440 x 2560 resolution Quad HD display. Again, unless ZTE has since decided against QHD panels, it seems like that more's to come from the company. Why 3gb ram ? İ want 4gb ram phones. 20nm. S6 has 14nm processor and 20nm DDR4 RAM. RAM size and RAM speed are two different things and both important in their own right. That being said 3GB should be plenty for anything today and the foreseeable future (meaning in the next year or two.) What apps are available for phones that would really work at 4GB but not at 3GB? When phones start becoming our main computing devices, meaning you go to your desk and just dock the phone and start working away on content creation or massive data processing the need will be there. Such a usage model does not really exist for these devices yet. Even reading web articles is still easier on a laptop with a nice sized screen, lets not get into trying to type a article/essay in a basic word processor. They're good in a bind when you need to open an email attachment and view a file, that's about it. We're getting close, we're just not there yet.